Milwaukee & Suburban Transit streetcar 972 is scheduled to operate on October 7th. Saturday, October 7th, 2017 the Illinois Railway Museum will celebrate the public transportation heritage of the Cream City. Milwaukee Transit Day will feature examples of rail and bus transit from across Milwaukee and southeast Wisconsin and spanning most of the 20th Century. 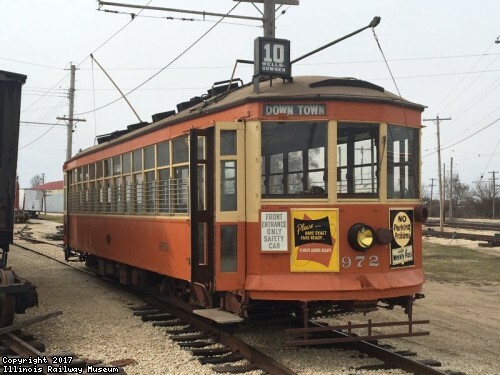 Street railway service within Milwaukee will be represented by Milwaukee & Suburban Transit streetcar 972, recently put back into operation following significant restoration work, and Chicago & Milwaukee Electric streetcar 354, which will be on static display. Milwaukee was the home to two famous interurban lines, the Milwaukee Electric and North Shore Line, and both will be represented. North Shore interurban coaches 714 and 749 will operate along with "Silverliner" combine 251 on the main line. Milwaukee Electric dump motor D13 will also be in service. Additional equipment from both interurban companies will be on static display including line car 604, caboose 1003, and the "Electroliner" from the North Shore as well as interurban car 1129 and freight motor M15 from the Milwaukee Electric. The industrial history of Milwaukee will be recognized with the operation of special freight trains using Wisconsin Electric Power steeplecab L7, which was once used at the Lakeside Power Plant in Milwaukee. The transit celebration won't be limited to rails; buses and trolley buses will operate as well. Milwaukee 441, the last operating Milwaukee trolley bus, will be in operation throughout the day alongside motor buses from the museum's collection. Storage barns at the south end of the museum which are normally off-limits will also be open for special guided tours focusing on Milwaukee transit equipment in those barns. Don't miss this unique event! Milwaukee Transit Day is October 7th, 2017 at the Illinois Railway Museum.